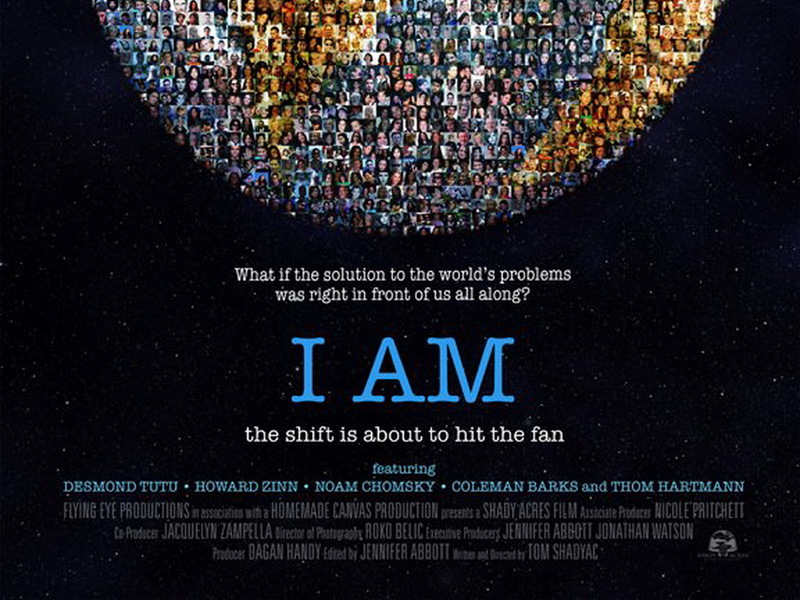 Wow, I just finished watching the documentary “I Am” (Tom Shadyac) twice! What a stimulating, thought provoking and inspiring documentary pointing to our common reality and what we are equipped to do about it. It is based on seeking the answers to two basic questions, “What’s wrong with our world?” and “What can we do about it?” One of Albert Einstein’s quotes summarizes it all. He said, “Humanity is going to require a substantially new way of thinking if it is to survive.” I agree. The documentary graphically highlights real, modern day issues we face, beliefs we hold, and attitudes we exemplify. It says we tell ourselves “stories” to live…stories that are often based on faulty premises. One of the many thoughts shared was the idea of many being cannibalistic…not eating the actual flesh of another but eating the life of another by unconscionable self interest and boundless materialism. What is enough? Were we really ‘born to buy’ and is ‘less’ really a bore?’ How is it okay to step over or simply ignore those around us who simply want and need life sustaining food? Many waste more than homeless people can imagine? What is further disturbing is the fact that we are hardwired for compassionate response to the trouble of others yet far too many ‘choose’ to override that until it is a major event i.e. 9/11, a tsunami, Hurricane Katrina, or the likes. Even more exciting was the revelation that science (a story we tell) is finally catching up with understanding what God put in place eons ago. We are truly amazing creatures with extraordinary abilities to influence and love. Our emotions modulate our heart signals and emanates a measurable magnetic field that impacts/affects those around us and ultimately our world! Ok…I know I’m throwing a lot at you in this one post but it is really fascinating and there is so much more. I’m thrilled that this was one of the films we were encouraged to watch in our Master Key Mastermind group and I likewise encourage you to do the same. I’ve enclosed a few links below so you can watch it, be amazed, and most importantly do something with what you learn. What is wrong with the world and simultaneously what is right with the world? The answer is, I am…and you are! Thank you so much for posting the link to watch the movie!! I hunted on YouTube for it, but could not find it. I look forward to seeing it!